Camilla d’Errico could not resist painting a small herd of custom art toys for DesignerCon. Aren’t they rainbow-tastic? Camilla has been very busy painting some of her favourite toys: “The Wandering Misfits” by Kathie Olivas and Brandt Peters. DesignerCon is the one convention of the year that she focus the most on creating custom one of a kind art toys. This year she was especially inspired by the human rainbow and her themes from her Sky solo show. Each of these colourful beauties are hand-painted and complimented with 3D elements to make them unique and individual. They will be available at her booth 2334 but her Patreon First Dibs patrons will get a preview and presale opportunity to collect a handful of originals before the show. You can sign up for First Dibs on Patreon. 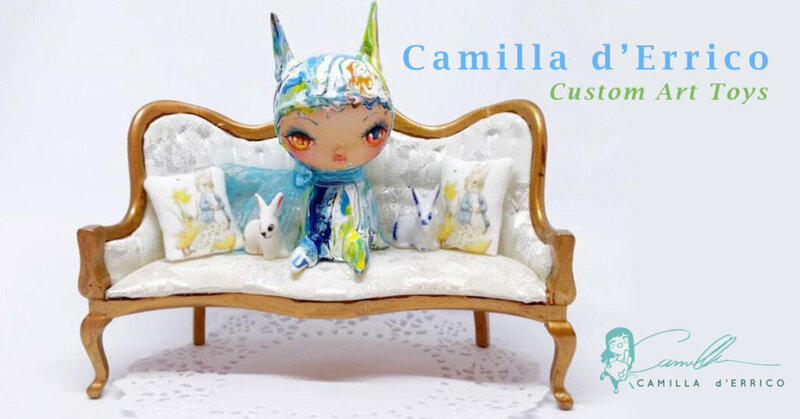 Go see Camilla d’Errico at DesignerCon Anaheim on Nov 16th-18th, Booth 2334 or follow her on Facebook and Instagram.